Clinton’s remarks on the South China Sea shouldn’t have surprised China, says Minxin Pei. It must be careful not to overreact. US-China ties appear to have hit another rough patch. First there was the revelation that China and Pakistan had signed a deal that would lead to the construction by China of two nuclear reactors in Pakistan, a development that has aroused much anxiety in Washington. But it was US Secretary of State Hillary Clinton’s declaration on July 23 at the ASEAN Regional Forum (ARF) in Hanoi that ‘The United States supports a collaborative diplomatic process by all claimants for resolving the various territorial disputes without coercion,’ and announcement that the United States ‘oppose[s] the use or threat of force by any claimant,’ that sent China into a rage, with officials accusing the Americans of attempting to ‘internationalize’ the South China Sea disputes. On the surface, Beijing seems to be fully justified in being upset about Clinton’s remarks. First, she clearly caught the Chinese by surprise. Apparently, no hint had been given to the Chinese that Clinton would make a momentous announcement at this year’s ARF, which is known chiefly as an uneventful talk-shop. Second, the symbolism carried by the venue itself, Hanoi, must deeply trouble the Chinese. Vietnam is one of the principal claimants in the dispute and Clinton’s remarks, although taken alone sounding neutral, actually are closer to the Association of South-east Asian Nations’ positions than to China’s. So in Beijing’s eyes, Washington has now taken sides. China believes that, despite the long-simmering territorial disputes in the South China Sea, that it has taken serious steps to address its neighbors’ concerns. 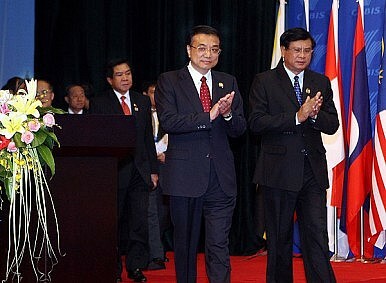 In 2002, for example, China and ASEAN signed a historic Declaration on the Conduct of Parties in the South China Sea that pledges to seek a peaceful resolution to the territorial disputes. Meanwhile, some ASEAN officials expect that China will sign a code of conduct at the end of this year. However, Beijing shouldn’t allow fury to muddle its judgment. To be sure, no US secretary of state has ever publicly declared a US position on the South China Sea disputes (making this perhaps the most significant aspect of the Clinton statement). But on the other hand, the substance of her remarks don’t depart from the long-standing US position on the South China Sea disputes. So in reality there’s been no policy change.